The Bubble Tip Anemone (also known as the BTA or Entacmaea quadricolor) originated from Singapore, Tonga and Fiji and is one of the easiest types of anemone to keep. The trunk is typically brown or maroon, but the tips come in a variety of colors, such as brown, green, orange, red, cream, pink, or a delicate rosy hue, and they can grow up to 12 inches in height (30 centimeters). To keep these anemones alive long term, you need to have high output lighting, such as Very High Output lighting, High Output Lighting, Metal Halide lighting, or even Power Compact Lighting for shallow tanks. These anemones also prefer a saltwater tank with a higher specific gravity (in the 1.023 – 1.025 range) and thrive in 25° – 28° C temperatures (75° – 82° F). They also prefer live rocks that are off the sand bed floor of the tank to sit on. They may move slowly around the tank to find a comfortable place to sit down but once they settle they are relatively stationary. A minimum of a 30 gallon tank (114 L) is necessary for these sea creatures. 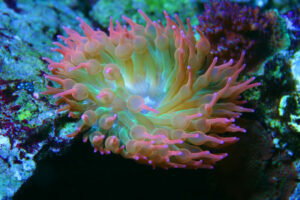 What do Bubble Tip Anemones eat? As the Bubble Tip Anemone are carnivores, they feed on finely chopped pieces of chopped up seafood (such as shrimp, mussel, krill, or clam) once or twice a week. To feed, simply stick the seafood on the end of a feeding stick or tank tongs and bring it close to the anemone. The anemone should grasp the food and will then consume it. There are only a couple reasons for the anemone to become upset. One is if the lighting, food supply, or water temperature becomes inadequate. This will cause the anemone to become sickly and move around in the tank. If there are other anemones or fish in the tank that make the Bubble Tip Anemone feel threatened, it may retaliate by striking at the offender with it’s venomous tentacles. The anemone will then most likely consume the dead sea creature, as it would do in the wild. The stings may cause skin irritations or allergic reactions, so always wear gloves when handling anemones. Do Bubble Tips need Clownfish? Clownfish are the most highly favored fish that are kept with an anemone, but you do not need a clownfish to keep an anemone, nor do you need an anemone to keep a clownfish. When a Bubble Tip Anemone is kept in good condition in may live to about 80 years in captivity. Like fish, anemones are a major commitment and although the bubble tip anemone is relatively low maintenance, it still requires effort to survive. For information regarding further care or answers to problems regarding your anemone, please contact your local aquarium. This entry was posted in Saltwater Invertebrates, Saltwater Tropical and tagged Anemone, bubble tip anemone, do anemones need clownfish, Do Bubble Tips need Clownfish, Entacmaea Quadricolor, food for anemones, general care information for bubble tip anemones, what do bubble tip anemones eat.